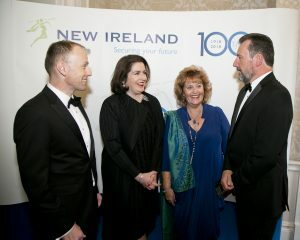 New Ireland celebrated its 100th anniversary in front of Minister Michael D’Arcy, industry representatives, colleagues past and present and family members of our first Managing Director, MW O’Reilly, with a Centenary Gala held in the Shelbourne Hotel. New Ireland is one of the country’s leading life, pensions and investments companies, with a national presence of nearly 800 people. New Ireland was founded on the 5th January 1918, with the original office based on O’Connell Street. Our roots are deeply connected with the foundation of the Irish state and its purpose was to keep Irish money in Ireland for the benefit of Irish businesses and the State. “To reach such a significant milestone is testament to colleagues past and present who continue to serve customers brilliantly and the support and loyalty of our business partners. “I am particularly delighted to see customers, business partners, industry peers, former and current colleagues from New Ireland and across the Group for such an exceptional event in our history. “I am delighted to be part of this special occasion for New Ireland Assurance – New Ireland was the first wholly owned Irish insurance company, established at a time of great change. “Over this past 100 years we have seen revolution and evolution, war and peace, economic climbs and declines – but in all of this, the resilience of those associated with New Ireland, has kept the company growing: always adapting to change, always forging ahead. Michael Murphy, managing director of New Ireland Assurance, Francesca McDonagh, Bank of Ireland CEO, Colette Filer, granddaughter of MW O’Reilly, the first managing director of New Ireland Assurance, and her son John Filer. New Ireland Centenary Gala Dinner at the Shelbourne Hotel 17 May 2018. New Ireland is one of the leading life assurance companies in Ireland, providing life insurance, pensions and investment solutions to individual and corporate customers. Founded in 1918 to retain monies in Ireland and help increase the standard of living, New Ireland was the first wholly Irish owned life assurance company to transact business in Ireland. Currently celebrating its centenary year, the reasons for founding the company remain strong today as New Ireland seeks to enable customers, colleagues and communities to thrive by protecting families, investing monies and securing futures. From a society in 1918 to a public limited company and member of the Bank of Ireland Group today, New Ireland has grown to hold offices nationwide – Dublin, Cork, Limerick, Galway, Sligo, Kilkenny, Santry and Dun Laoghaire – and currently employs over 800 staff.